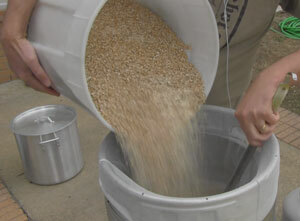 Pouring in 20 pounds of grain to get the process started. I’ve long been a champion of small batches, but every now and then I find a recipe that I want to brew a lot of. My Cream Ale recipe is one of those. Thanks to demand from friends (and myself), a batch of this stuff tends to go pretty quickly. To brew 10-gallon (38-L) batches, I don’t have an elaborate brewing “sculpture,” but I do have a stainless steel keg that has been converted into a kettle. 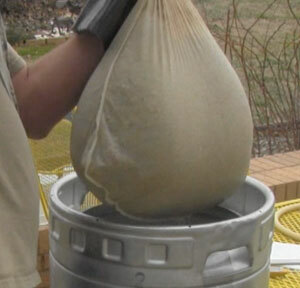 * Using the Brew in a Bag (BIAB) technique, that “keggle” can double as a mash tun and kettle, all in one. The biggest challenge when brewing large BIAB batches is lifting and dealing with big, hot, and wet bags of grain after the mash is done. Many BIAB brewers have a pulley system mounted over their brew pots to help them cope. I have a different approach, since I like to brew outside on my patio. But, I’m getting ahead of myself. Let’s start at the beginning. To start the process, I heat my strike water in the kettle to the appropriate temperature (see the recipe below for specifics). I then add the nylon BIAB bag, making sure the top of the bag is secured by stretching it around the top of the keg. I pour the milled grain into the immersed bag, stirring to avoid dough balls. After checking to make sure the proper mash rest temperature is achieved, I wrap the kettle in towels and/or blankets to hold the temperature for an hour. Then comes the tricky part. While the mash is resting, I bring sparge water up to 170˚F (77˚C) in a 10-gallon (38-L) brew pot. At the end of the mash rest, I pull the BIAB bag out of the kettle, letting it drain for a couple of minutes. When most of the wort has drained away from the grain, I put the bag into the sparge water. Why don’t I choose to mash in the full volume of water and not sparge? Since I don’t have a pulley from which to hang the bag and let it fully drain, I have found that I can sparge the grain in the second, smaller pot and use my ladder to hang the bag up above it afterwards. It is a bit of a workaround, but I like it. After sparging, draining, and squeezing the second runnings out of the bag, I combine the contents of the smaller pot with the larger one. Then, onto the boil. Rubber barbecue gloves make handling and squeezing the bag easy. I don’t usually use hop sacks during the boil, preferring to let the hop pellets “go commando” and freely circulate in the wort. However, since I collect the wort from the keggle through its spigot at the bottom, I do use a hop bag here to contain most of the hop debris. I use rubber barbecue gloves to periodically squeeze the hop bag to make sure the wort gets the bitterness it deserves. At the end of the boil, I use an immersion chiller to chill the wort, racking it into two carboys. In the most recent batch, I pitched Safale US05 into one half and Danstar Nottingham dry yeast into the other. 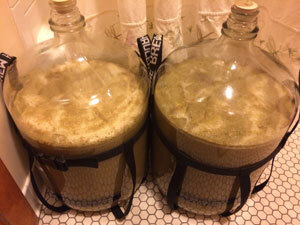 We’ll see how the two yeast strains stack up against each other. Past batches of this recipe have been very Pilsner-esque. The flaked maize in the mash tend to dry out the beer a bit, and the Saaz hops lend a crisp and satisfying finish. This will be delicious in the spring . . . if there is any left. Heat 10 gallons (38 liters) strike water to 161˚F (72˚C). Line the kettle with a nylon Brew in a Bag bag. Add grain, stirring to avoid dough balls. Rest mash at 152˚F (67˚C) for one hour. In the meantime, heat 3.5 gallons (13 liters) of sparge water to 170˚F (77˚C) in a second pot (big enough to hold the grain). At the end of the mash rest, lift the bag and let it drain until most of the wort is in the kettle. Transfer the grain bag to the second pot to sparge. Stir the grain in the sparge water to rinse. 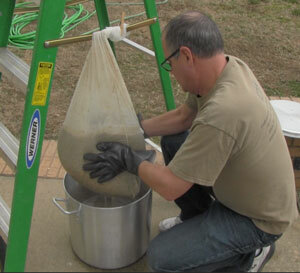 Use a ladder strut to hang the grain bag over the second pot and squeeze the remaining wort out. (Rubber barbecue gloves are helpful.) Combine the contents of the second pot with the main wort and bring to a boil. At boiling, add the initial hop addition and boil for 60 minutes. Add the finishing hops at flameout. Chill the wort, transfer to fermenters, aerate, and pitch yeast. *Please don’t take kegs obtained in an unauthorized way from breweries to make kettles. Looks nice and simple. Might try. Do you know the % AA of the saaz? Would you always just add 4 oz. of saaz for bittering, regardless of the % AA of the saaz you had on hand? The Saaz hops were at 4.8% alpha acid. This beer is not very bitter – pretty well balanced. If the alpha acid level fluctuated a lot from that, I would adjust.